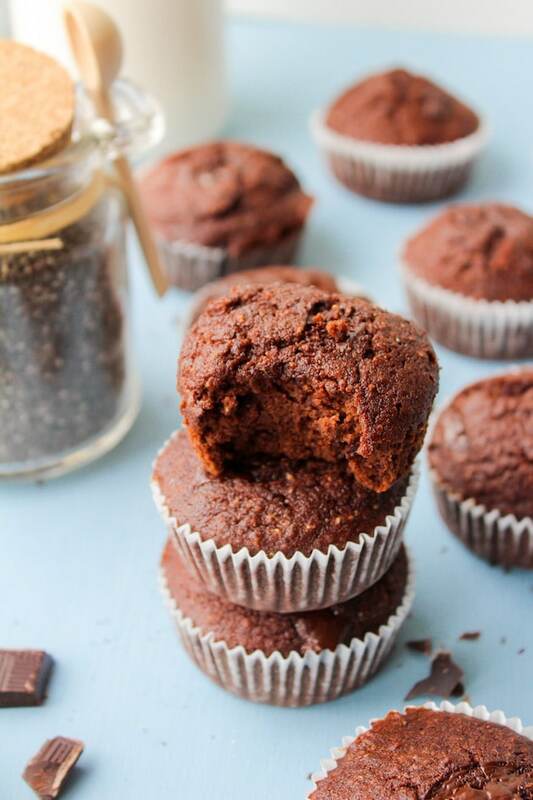 These Chocolate Chia Seed Muffins are paleo, dairy free, grain free and provide the perfect pick-me-up for when you’re craving something sweet. Hello again! Sarah’s busy writing up the recipe to a new grain-free cookie recipe that she has coming up (they’re insanely good) so you’re gonna have to listen to me wax lyrical about these chia seed muffins instead. Normally I find writing blog posts to be a daunting prospect but considering I’ve eaten about 10 of these in the last couple of weeks I feel like I’m qualified enough for this one! The idea for these beauties came about during one of our trips to Meadowhall shopping centre. The real purpose of the trip was for me to buy some new walking shoes – or at least that was the plan until I noticed their price tags. 🙁 So we called an audible and wandered into Lakeland kitchenware. It feels like whenever we go in there we end up leaving with inspiration for a new recipe. The first time we went it inspired this ice cream recipe, as I insisted we buy their orange oil. This time around there was a very tempting box of chocolate chia seed muffin mix winking at me as we walked in. It was decided – we had to make our own version. So our (read: my) first attempt at this recipe was pretty good, but nothing spectacular. I’m not the greatest when it comes to eyeing my ingredients so they came out a little bit on the dry side. A valiant effort, but not quite what we were looking for. Sarah steps in for round two, and of course, she knocks it out of the park. It’d be annoying how good she is at figuring out recipes first try if it wasn’t for the fact that I get to eat the results. I suppose there’s no shame in being schooled by the professional! Actually, you know what? I do have a serving suggestion that goes a little bit off the beaten track. Break off some of this halloween-inspired chocolate bark and stick it on top if you want to dial the decadence of this recipe up to 11. I’m not sure if Sarah tried it this way when she ate these but it gets the Mike seal of approval. Hope you enjoy! 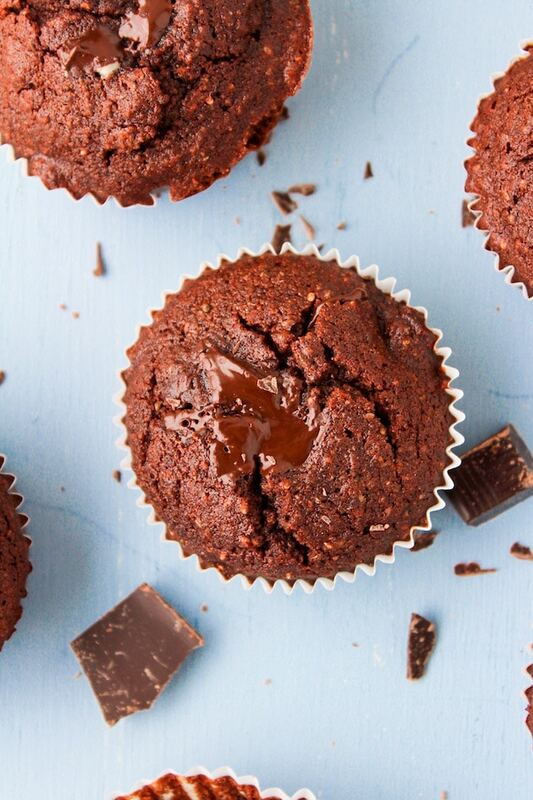 Don’t forget to #asaucykitchen on instagram if you make these chocolate chia seed muffins! I love seeing what you make with! You can also post your pictures to our facebook page! 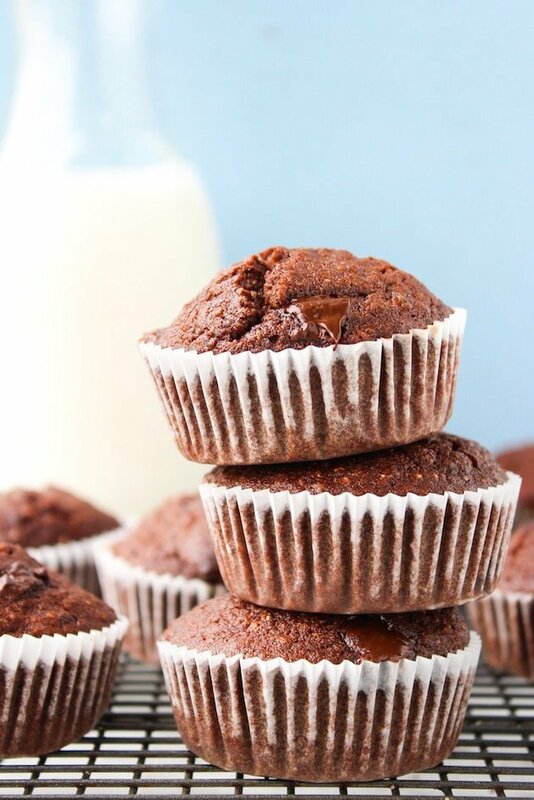 These Chocolate Chia Seed Muffins are paleo, dairy free, grain free and provide the perfect pick-me-up for when you're craving something sweet. Heat your oven to 350°F/180°C and grease or line a 12 cup muffin tin. In a large mixing bowl beat together the eggs, coconut oil, vanilla extract, honey and milk until well combined. 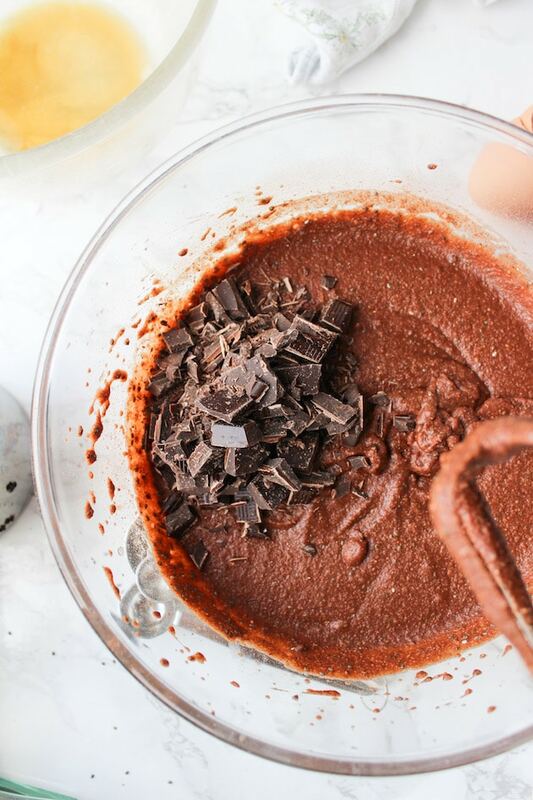 Add the coconut flour, cocoa powder, chia seeds, baking powder and salt to the bowl and mix to combine until you have a smooth batter. Stir in the chopped chocolate pieces. Spoon the batter evenly into the muffins tins. Place in the oven and bake for 18-20 minutes, or until a knife going into the center comes out clean. Remove the muffins from the oven and let cool for about 10 minutes before flipping the tin over and removing the muffins. These look delicious. I am confused, however, how many muffins to divide batter into. Info at top of recipe states “servings: 10 muffins”, but recipe states grease or line 12 muffin tin. Hi there, these look delicious. Going to give these a try. The sugar content per muffin is quite high though and I was wondering if the honey can be halved or even quartered and how that would affect the batter? Thank you. Hi Marj! You could try using a low sugar syrup substitute for the sub (something like Sweet Freedom maybe). I wouldn’t recommend using less though because the honey adds moisture to the batter to help balance out the coconut flour. Coconut flour can be very absorbent which makes subbing things out tricky. Hope that helps! Since my husband was diagnosed with multiple myeloma (a form of cancer of the plasma cells in your blood), I’ve been working on changing his diet and improving his nutrition. I’ve been trying various gluten free and white sugar-free recipes. In addition to my husband (who is already a picky eater), I also have two picky kids (14 and 10 y/o), so it has been difficult to make everyone happy – until this recipe! Everyone loves it (our daughter tried to claim them all for herself), and my husband loves the texture of the chia seeds, which is exactly why I like this recipe even more – I had been trying to figure out how to add chia seeds into his diet! Thank you! Hi Julie, I’m so glad you were able to find something that everyone likes! Thank you so much for coming back to let me know what you all thought! Also – if you ever need any help finding recipes or anything like that please let me know! Can these be made with vegan eggs? if i dont have coconut flour and coconut milk, can i use normal milk and white flour instead? or any other flour? Your recipes are amazing! Thanks so much for including the grams measurement as I find it so much easier to weigh ingredients than to measure with cups. These muffins are delicious and such a treat!! My kids love them! You could sub it with flax seed, but I’m almost positive that you could leave out the seeds all together! Where’s the recipe???? I get no links to it? Found this via pinterest. Hi Debbie! So sorry about that! I recently updated the format of my recipes and it looks like that process has deleted a few of them – this one is back up now. Thanks so much for pointing that out to me – sorry about the confusion! Is raw cacao powder the same as cocoa powder in your recipe? Thanks! Yes! Hope you enjoy the muffins! Could you use oatmeal flour instead of coconut? I’ve never tried it with oat flour so I can’t really offer too much advice here. I imagine if you wanted to play around with the recipe you would need to add more oat flour. Since coconut flour is so absorbent you need more than you would in most recipes – wish I could be more help here! Looking back at the pictures, though, your batter is definitely chocolate-colored before you stirred in the chocolate, so… Like I said, they’re delicious anyway, and I’ll definitely make them again and again; but if anyone can help, I’m just wondering about how much cacao powder I should add to the batter to make it chocolate next time around. Thanks in advance! Oh my goodness I am so sorry! I was recently updating something in this recipe and I think I somehow managed to delete the cocoa powder! It’s fixed now – there should be 1/3 cup. Thank you so much for pointing that out to me! I’m so glad you still liked it despite the fact that I had it up wrong! Just wanted to let you know I made these again this morning, this time with the cocoa powder, and they were even more awesome! Thanks! Yay! Thanks for coming back to let me know how it went!